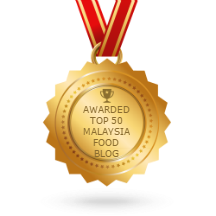 It's Potluck Week at I Heart Cooking Clubs (IHCC), our last theme for 2017. It has been a wonderful year baking and cooking with my friends at IHCC. And looking forward to another delicious year ahead. 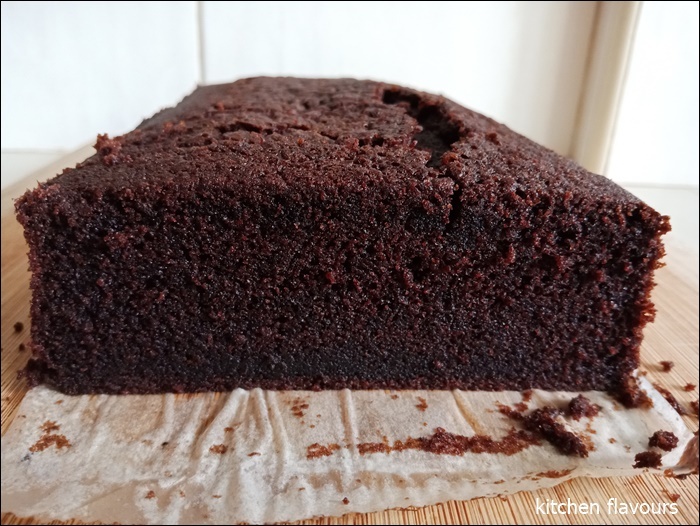 For a sweet ending for 2017, I've made Nigella's Dense Chocolate Loaf Cake. The cake is moist and dense yet very tender and slightly crumbly. I did reduce the dark brown sugar to only 1 cup (loosely packed) and it was just right for us. And have used salted butter. Preheat the oven to 375F, put in a baking sheet in case of sticky drips later, and grease and line the loaf pan. The lining is important as this is a very damp cake; use parchment or one of those loaf-pan-shaped paper liners. Cream the butter and sugar, either with a wooden spoon or with an electric hand-held mixer, then add the eggs and vanilla, beating in well. Next, fold in the melted and now slightly cooled chocolate, taking care to blend well but being careful not to overbeat. You want the ingredients combined; you don't want a light airy mass. Then gently add the flour, to which you've added the baking soda, alternately spoon by spoon, with the boiling water until you have a smooth and fairly liquid batter. Pour into the lined loaf pan, and bake for 30 minutes. Turn the oven down to 325F and continue to cook for another 15 minutes. The cake will still be a bit squidgy inside, so an inserted cake tester or skewer won't come out completely clean. Place the loaf pan on a rack, and leave to get completely cold before turning it out. (I often leave it for a day or so; like gingerbread, it improves). Don't worry if it sinks in the middle; indeed, it will do so because it's such a dense and damp cake. Once again I've baked from Cake Keeper Cakes by Lauren Chattman. The cake I've chosen is Clove-Scented Chocolate and Apricot Loaf, which I've wanted to bake for ages. 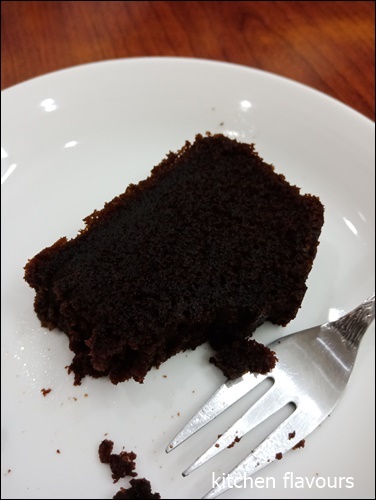 It is a chocolate cake, which has a spice ingredient that is not always used in bakes, ground cloves. 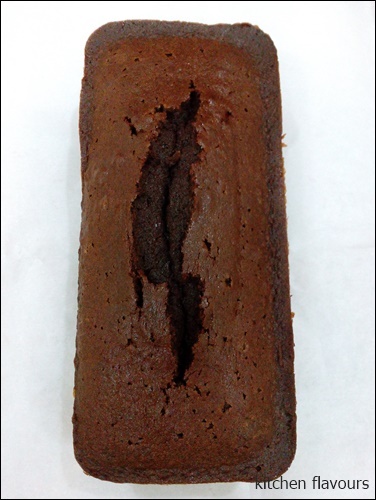 Described by the author "Just a small amount of ground cloves gives this chocolate loaf a mysterious and complex flavor. 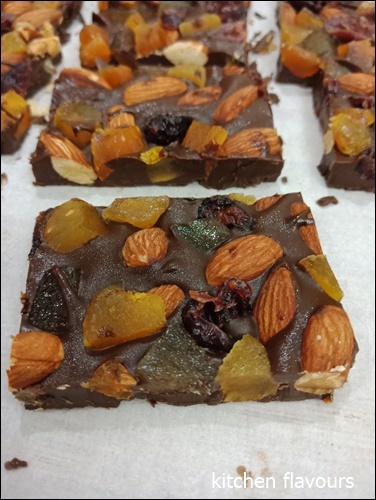 Apricots add moisture, color, and a beautiful acidity that complements the chocolate and spice". The cake is moist, with tender crumbs and delicious! Everything combines together perfectly, the cloves, cinnamon, cocoa powder and the apricots, with a very nice aroma from the spices. The only thing is, the chopped apricots sunk to the bottom of the cake, looks like I did not chop the apricots fine enough. But not an issue, as the cake is really good. 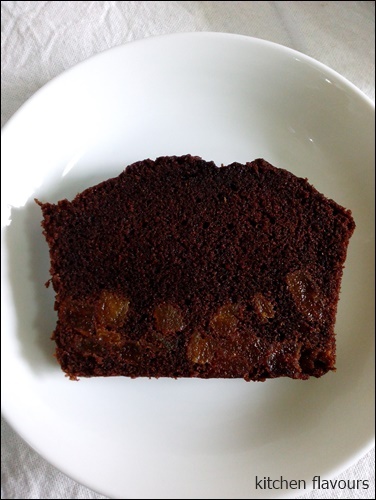 I will chop the dried apricots to smaller pieces the next time, as this cake is worth a repeat! Preheat the oven to 325F. Grease a 9-inch by 5-inch loaf pan and dust with flour. Combine the apricots and 1 tablespoon of flour in a small bowl. Set aside. Whisk together the remaining 1 cup flour, cocoa powder, baking powder, salt, cinnamon, and cloves in a medium mxing bowl. Turn the mixer to low speed and add 1/3 of the flour mixture, then 1/2 of the milk. Repeat, ending with the flour. After the last addition, mix for 1 minute on medium speed. Stir in the apricots. Scrape the batter into the prepared pan and smooth the top with a rubber spatula. Bake the cake until it is firm to the touch and a toothpick inserted in the center comes out clean, about 1 hour and 10 minutes. Let the cake cool in the pan for 5 minutes, invert it onto a wire rack, then turn it right side up on a rack to cool completely. Slice and serve. 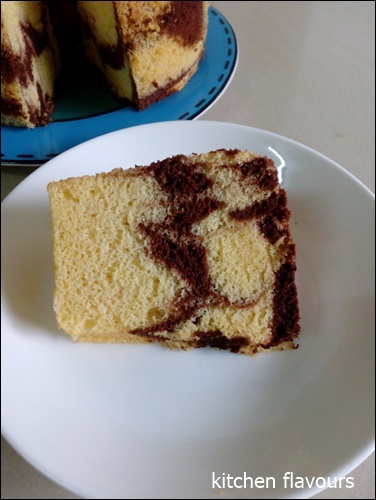 Do visit The Cake Slice Bakers official blog to see what everyone has baked this month. 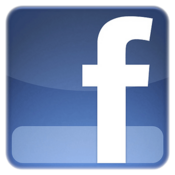 If you would like to join us, please leave a message with the administrator, you can find it on the left side bar. This second bake is from Cake Keeper Cakes, one of my favourite baking book. I like that the bakes in this book are fuss free and the cakes are all perfect for anytime snacking, makes a nice breakfast and tea-time treat with a cup of coffee or tea. According to Lauren Chattman, this is her older daughter's favourite cake out of all the bakes in this book. I can see why it is, the cake is light, fluffy, moist and so, so good! I've already made this a few times, and each time, it was gone pretty quick! Preheat the oven to 325F. Have ready a 9-inch ungreased angel food tube pan with a removable bottom. Whisk together the cocoa powder, water, 1 tablespoon sugar, and 1 tablespoon oil in a small bowl. Set aside. Combine the flour, baking powder and salt in a medium bowl and whisk thoroughly to break up any lumps. Set aside. Place the egg yolks and whole eggs in a large mixing bowl and beat on medium-high speed until lightened in colour, about 3 minutes. With the motor running, add 1 cup sugar in a slow, steady stream and continue to beat until the mixture is light and increased in volumn, about 5 minutes longer. With the mixer still running, slowly pour in the remaining 1/2 cup oil and continue to beat for 1 minute longer. With the mixer on low speed, add 1/3 of the flour mixture, then 1/2 the water mixture, then another 1/3 of the flour, the remaining water mixture, and the remaining flour mixture, scraping down the bowl once or twice as necessary. Stir in the vanilla. With clean beaters and using a clean mixing bowl, whip the egg whites on medium speed until frothy. Add the cream of tartar and continue to beat on medium speed until the egg whites begin to turn white. With the mixer still on medium speed, pour in the remaining 1/2 cup sugar in a slow, steady stream and whip until the whites hold stiff peaks. Fold 1/4 of the yolk mixture into the whites to lighten. Then fold the remaining whites into the yolk mixture, gently but thoroughly. Transfer 1/3 of the cake batter to another bowl and gently fold in the chocolate batter. Pour half of the yellow batter into the tube pan. 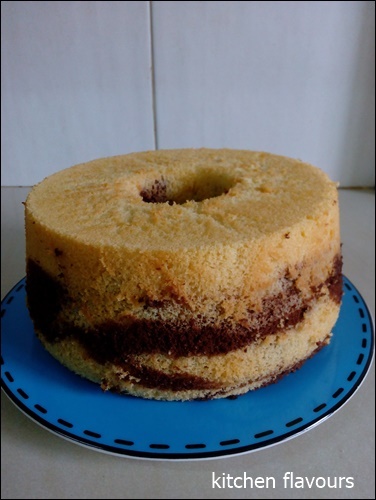 Top with half of the chocolate batter. Repeat with the remaining yellow and chocolate batter. Smooth the top with a rubber spatula. Use a butter knife to swirl the batters together, taking care not to overmix. Bake the cake until it is golden brown and the top springs back when you touch it, 55 minutes to 1 hour. Remove the pan from the oven. If your pan has feet, invert the pan onto a heatproof surface and allow it to cool. If your pan doesn't have feet, invert 4 heatproof drinking glasses on the counter and rest the inverted pan on top of the glasses to allow air to circulate around the cake while it cools. Let the cake cool in the pan completely, about 2 hours. To remove the cake from the pan, run a sharp paring knife around the edges, being careful to leave the golden crust intact. Remove the sides of the pan. Invert the cake onto a serving platter. Run the paring knife under the removable bottom of the pan and lift it off the cake. Slice and serve. I only have five of these books and out of the five, my most favourite is The Cake Book by Tish Boyle. I have made quite a number of recipes from it with very good results. 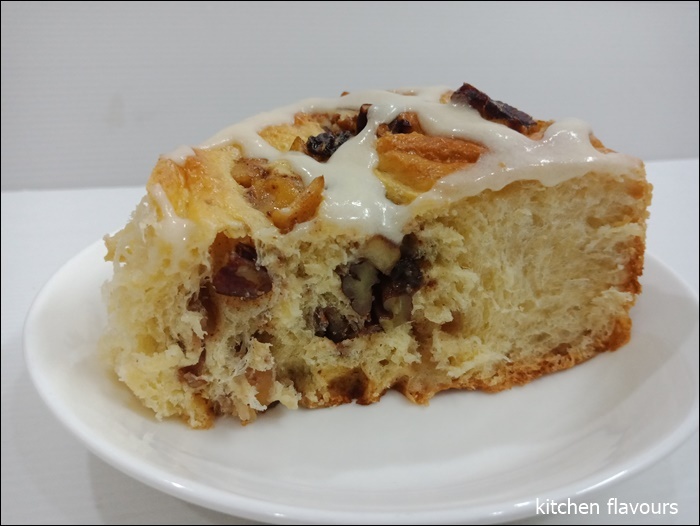 So for this month's free baking, I've made another one of her fabulous recipes, Filled Coffee Cake, which is really a sweet yeasted bread, with apple-pecan-raisin-cinnamon filling. Start by preparing the apple pecan cinnmon filling which needs to be cooled down before using it as a filling for the sweet bread. Chopped apples are sauteed with some melted butter, add some brown sugar, cook till apples are tender, then add some flour, cinnamon, raisins and pecans. Remove from heat and allow to cool. The dough has the softness of a brioche dough as most sweet breads are, and lovely to work with. Soft, supple and not at all sticky. It was really easy to roll. Slice the rolled filled dough into 2 inch pieces and place in a greased springform pan, allow to rise, brush with some egg wash, then bake as directed in the recipe. I did reduce some sugar for both the bread and the filling. The bread bakes up really nice and golden. Allow to cool, then glaze with White Drizzle Glaze. I do not usually eat my sweet breads glazed, as I prefer them without, but for this time, I decided to include the glaze. 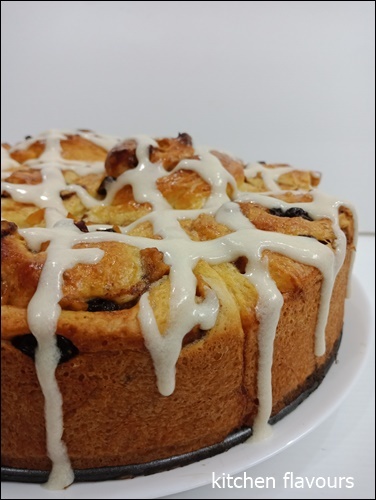 To make the White Drizzle Glaze, mix icing sugar, vanilla extract and some cream to the desired drizzle consistency. This sweet bread is pretty good! 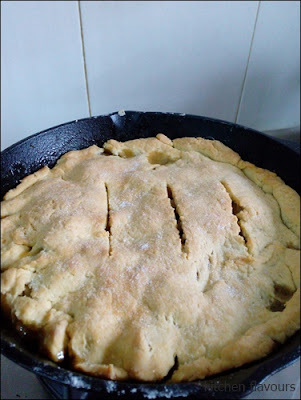 With moist, soft crumbs, delicious with the apple filling, a slice is just wonderful with a cup of tea. Another keeper recipe from this wonderful book! 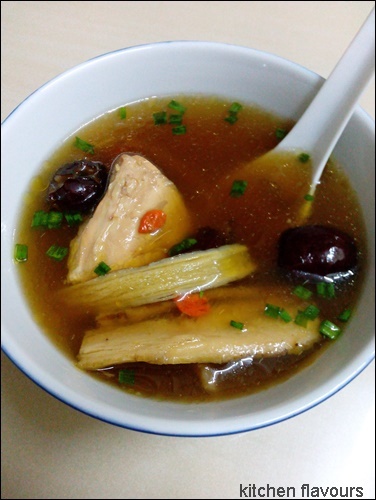 A healthy delicious chicken soup, made with Chinese herbal ingredients, which can easily be found at any Chinese herbal shops. 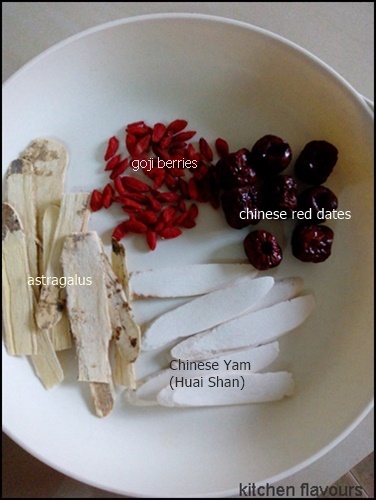 The Chinese herbs used are Chines yam (shan yao or huai shan), astragalus (huang qi), goji berries (gou qi zi), and Chinese red dates (hong Zao). According to the recipe, the herbs are to be tied in a cheesecloth (except for the goji berries and red dates), then add to the pot and simmer, so that they can be easily removed before serving the soup. I have however, did not use any cheesecloth and simply placed the herbs in the pot. I have omitted the soy sauce since I have used a small pinch of salt. 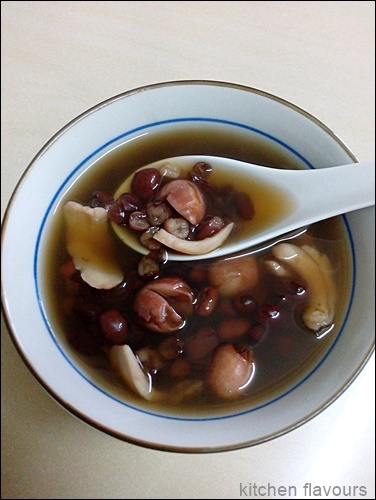 The herbs are not meant to be eaten, though the goji berries and red dates can be consumed, they contribute the sweetness to the soup. Use free range chicken if possible, it makes a whole lot of difference to soups like this. This is a tasty soup with healthful properties from the herbs. In a large soup pot, combine the chicken, water, and salt and bring to a boil. Skim off any excess oil or fat. Tie the ginger, garlic, Chinese yam, and astragalus together in a piece of cheesecloth (just place the herbs in the center and tie the ends). This will make it easy to remove the herbs later. Add the cheesecloth bag of herbs and the goji berries, Chinese red dates, and wine to the pot. Bring it back to a boil, then lower the heat and simmer, covered with the lid slightly ajar, for 45 to 60 minutes. Skim off any excess oil or fat. When the soup is done, remove and discard the bag of herbs. Add soy sauce to taste and garnish with the green onions. 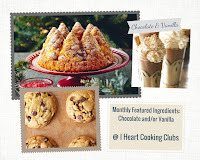 It's time for Chocolate and Vanilla, over at I Heart Cooking Clubs (IHCC). Having missed last week's theme, I am not about to miss this week's too. I've made Ina Garten's, French Chocolate Bark. 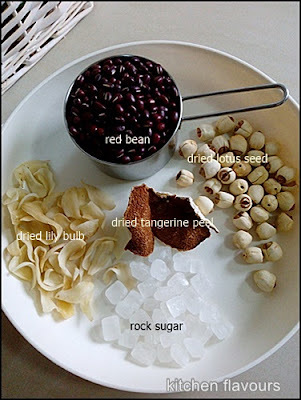 This is super easy, and I have all the ingredients in my pantry. Well, almost, with some subs of ingredients. Ina uses salted roasted cashews, which I have replaced with almonds. I did not have any dried cherries (they are very expensive! ), so I have used dried cranberries. And also did not have semi sweet chocolate, so I have used milk chocolate instead, which is melted together with bittersweet chocolate. Melt both chocolates, spread on parchment paper, then scatter the rest of the ingredients over the chocolate spread. Ina has given the instruction on which ingredient to be scattered first. I was tempted to mix the ingredients in a bowl and then simply scatter them over the chocolate spread. But on second thoughts, decided to follow Ina's instructions instead. 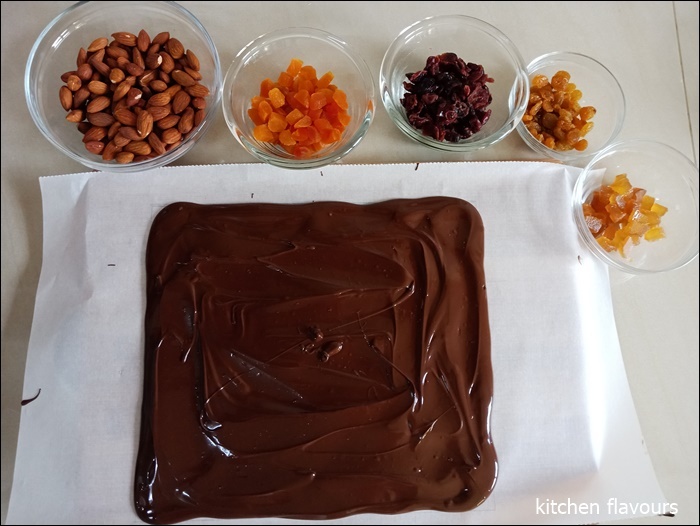 The melted chocolate is spread in a 9x10-inch rectangle. 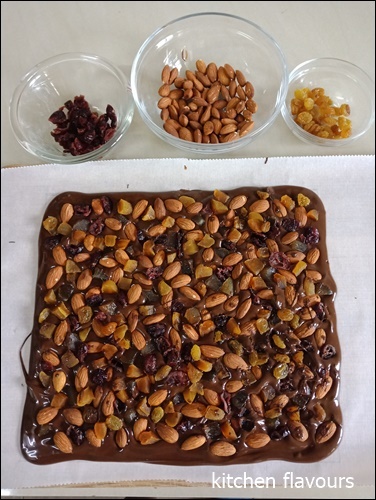 The rest of the ingredients ; toasted almonds, chopped dried apricots, dried cranberries, golden raisins and chopped crystallized ginger. 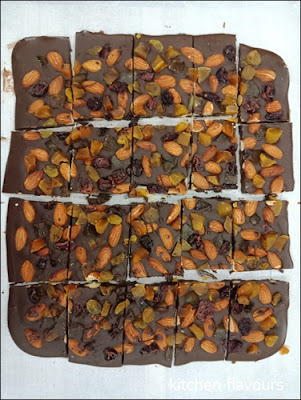 I did not use all of the almonds, and there's some balance of the dried cranberries and golden raisins. The chocolate spread is already full! I am glad that I did not mix all the almonds and the dried fruits together in a bowl. Ina says to set aside for 1 to 2 hours until firm, then cut to serving pieces. Well, mine did not set at all, so I pop the bark in the fridge to set. The chocolate bark sets nicely in the fridge. But they started to melt within minutes after cutting. Our hot and humid weather does that to chocolates, that is why we can never keep our chocolate at room temperature, they are always kept in the fridge. So the cut pieces were kept in an airtight container and store in the fridge. These barks are yummy and addictive! Not that kind of addictive snack that you would be eating pieces of it at one sitting, but rather addictive in a way that you would think of having another piece after half an hour and still think about it another hour later! They would not last long in the fridge, that's for sure! Preheat the oven to 350 degrees. Using a pencil, draw a 9x10-inch rectangle on a piece of parchment paper placed on a sheet pan, then turn the parchment paper over. Spread the cashews in one layer on another sheet pan and bake for 8 minutes. Set aside to cool. Place the semisweet chocolate and half the bittersweet chocolate in a glass bowl and microwave on high power for 20 to 30 seconds. (Don't trust your microwave timer; time it with your watch). Stir with a rubber spatula. Continue to heat and stir in 30-second increments until the chocolate is just melted. Immediately add the remaining bittersweet chocolate and allow it to sit at room temperature, stirring often, until it's completely smooth. Stir vigorously until the chocolate is smooth and slightly cooled; stirring makes it glossier. Pour the melted chocolate onto the parchment paper and spread it lightly into the drawn rectangle. Sprinkle the top evenly in the following order; first the ginger, then the cooled whole cashews, the cherries, apricots, and raisins. Set aside for 1 to 2 hours until firm. Cut the bark in 18 to 20 pieces and serve at room temperature. 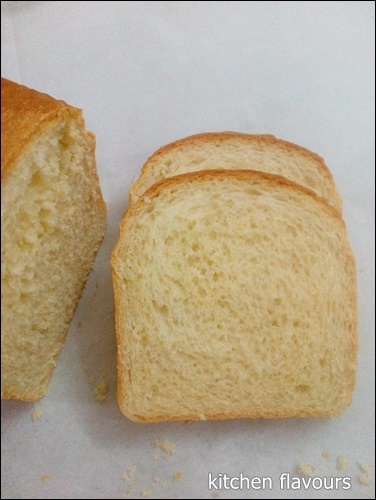 This simple white bread from Bread Illustrated by America's Test Kitchen is a lovely bread. It has nice crust and soft airy crumb. Very easy bread to make and bakes up to a lovely loaf. I did reduce the salt though, using only half the amount called for, 3/4 teaspoon instead of 1-1/2 teaspoons. I like it's beautiful soft crumbs. Great as a sandwich bread, or spread with your favourite jam and salty butter. It is lovely toasted, spread with a generous dollop of cold salty butter, which will melt onto the hot crispy toast, perfect with a cup of hot steaming coffee! Whisk flour, yeast, and salt together in bowl of stand mixer. Whisk milk, water, melted butter, and honey in 4-cup liquid measuring cup until honey has dissolved. Grease 8-1/2 by 4-1/2-inch loaf pan. Press down on dough to deflate. Turn dough out onto lightly floured counter (side of dough taht was against bowl should now be facing up). Press and stretch dough into 8 by 6-inch rectangle, with long side parallel to counter edge. Roll dough away from you into firm cylinder, keeping roll taut by tucking it under itself as you go. Pinch seam closed and place loaf seam side down in prepared pan, pressing dough gently into corners. Cover loosely with greased plastic and let rise until loaf reaches 1 inch above lip of pan and dough springs back minimally when poked gently with your knuckle, 1 to 1-1/2 hours. Let loaf cool in pan for 15 minutes. Remove loaf from pan and let cool completely on wire rack, about 3 hours, before serving. It's Potluck week at I Heart Cooking Clubs (IHCC). 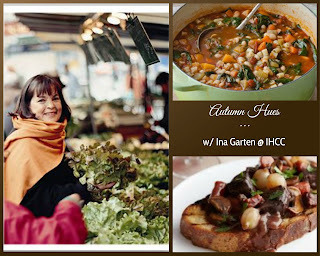 We are free to choose any recipes from IHCC current or past featured chefs. And I've made Ina Garten's Zucchini Pancakes for our brunch snack. Zucchinis are grated using the coarse side of the box grater. 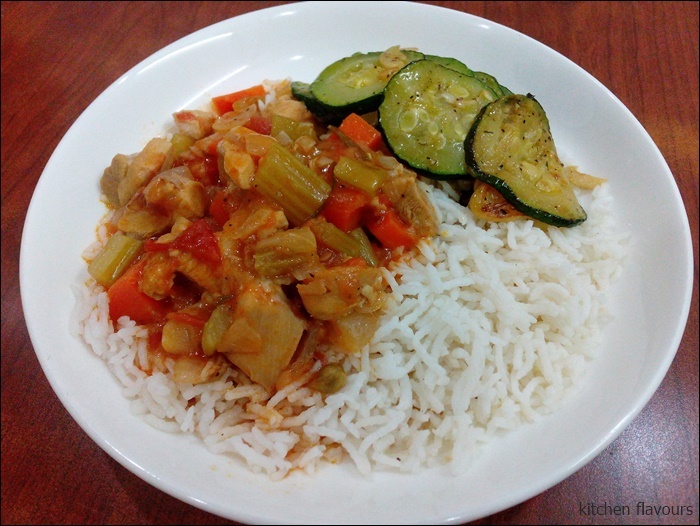 Stir the grated zucchinis together with grated onion, eggs, flour, baking powder and salt. I've added red chillies to the batter, deseeded and thinly sliced. I find that the batter is quite runny and have added a few extra tablespoons of flour. The next time I will squeeze out some of the juices from the zucchini. Scoop heaping tablespoons of the batter and pan-fry in hot oil on both sides until golden. These may be eaten with sour cream, or with your favourite sauce. I've made one of our favourite and simple dipping sauce, a mixture of mayonnaise and Sriracha sauce, which we love to dip our fritters or savoury pancakes. These pancakes are delicious and makes a wonderful brunch snack. This recipe is from Joanne Chang's cookbook, flour, too, one that has been in my possession for quite sometime, but have never made anything from it before. Time to try some of the recipes and I've selected this Oven-Baked Tortilla for our lunch. The potatoes are first boiled until cooked through, then peeled and cut into 1/2 in slices. Yellow onions, red bell peppers are cut into pieces, then sauteed with some olive oil together with minced garlic until the vegetables soften, a few minutes. Season with salt and pepper. Transfer the vegetables to a bowl. In the same skillet, heat some oil, then add the cooked potatoes, sprinkle with paprika, season with salt and pepper, and cook until the potatoes are brown in some places, do not turn the potatoes for three or four minutes. Turn the potatoes and brown the other side. Remove the skillet from the heat. Whisk together the eggs, milk, Parmesan, scallions and parsley. Season with salt and pepper. 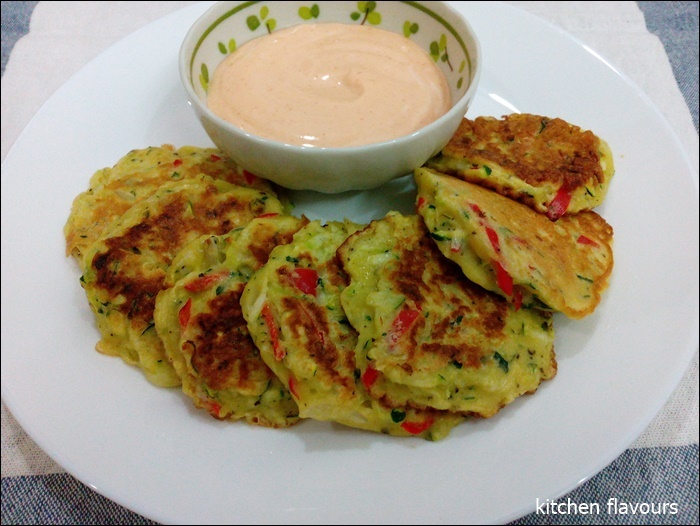 Spread the vegetables over the potatoes, pour the egg mixture and bake for 16 to 20 minutes until puffy and brown. Remove from oven and let cool for 5 to 10 minutes before serving. A slice or two served with some greens makes a delicious lunch. In a medium saucepan, combine the potatoes with water to cover and bring to a boil over high heat. Reduce the heat to medium-low and simmer until the potatoes are cooked through and can be easily pierced with a fork; the timing will depend on the size of the potatoes. Drain and transfer the potatoes to a bowl. Set aside until cool enough to handle, then peel (the skins should come off quite easily) and cut crosswise into slices 1/2 in/12mm thick. Preheat the oven to 450F/230C, and place a rack in the centre of the oven. In a medium bowl, whisk together the eggs, milk, Parmesan, scallions, and parsley. Season with 1/4 tsp each of the salt and pepper. Set aside. In the skillet, heat 1 tbsp of the olive oil over medium-high heat. Add the yellow onion, bell pepper, and garlic and sweat for several minutes, or until the vegetables soften. Season with 1/4 tsp salt and 1/8 tsp pepper. Transfer the vegetables to a bowl and set aside. In the same skillet, heat 3 tbsp of the oil over high heat. Carefully add the potatoes and reduce the heat to medium. Sprinkle evenly with the paprika, the remaining 1/4 tsp salt, and the remaining 1/4 tsp pepper. Do not turn the potatoes for 3 to 4 minutes. Once the potatoes are nicely browned on the first side, flip them over and drizzle the remaining 1 tbsp oil into the skillet. Let the second side brown for a few more minutes. Don't worry, if not all of the potatoes get browned, the point is to get a nice crust on some of the potatoes. Remove the skillet from the heat. Spread the vegetables mixture evenly over the potatoes, then carefully pour the egg mixture evenly over the potatoes and vegetables. Bake for 16 to 20 minutes, or until the egg puffs and browns and the middle is just barely set when tested with a knife tip. Remove from the oven and let cool in the skillet for 5 to 10 minutes. Serve warm or at room temperature. The tortilla can be made up to 2 days in advance and stored in an airtight container in the fridge. Bring to room temperature or warm in a 300F/150C oven for 15 minutes before serving. I Heart Cooking Clubs (IHCC) is cooking The Way To Jeffrey's Heart this week. 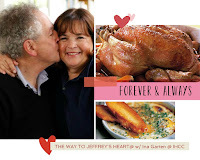 Jeffrey is the husband of Ina Garten, and in IHCC words "Ina Garten knows the way to a man's heart is through his stomach and she has known The Way To Jeffrey's Heart for nearly 50 years! If you've watched Ina Garten on Food Network then you know that Jeffrey is really the star of the show. Ina is constantly spoiling Jeffrey with her cooking, whether she is making his Friday night chicken, packing them a picnic, or cooking French in their Parisian home. In fact, as proof, she has an entire cookbook dedicated to Cooking For Jeffrey!" Well, I do not have Ina's latest cookbook Cooking For Jeffrey, but I would like to think that this Parmesan Chicken recipe of Ina's from one of her other cookbooks and Mustard-Roasted Potatoes are some of Jeffrey's favourite, as obviously he loves everything that Ina cooks! Lucky Jeffrey! First, the Mustard-Roasted Potatoes, which takes an hour to bake. I've used Russet Potatoes, peeled and cut into chunks. 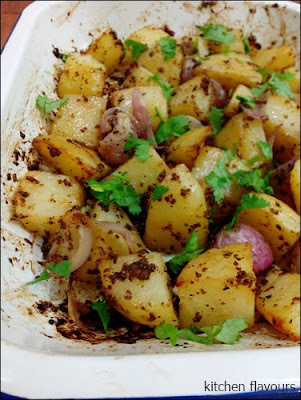 Toss the potatoes with sliced onions, then mix with olive oil, whole grain mustard, salt and pepper in a baking tray. Bake for 50 minutes to one hour until the potatoes are tender and brown in some spots. Turn the potatoes every 15 minutes or so, so that they cook evenly. Serve with some chopped parsley, of which I have used fresh coriander. 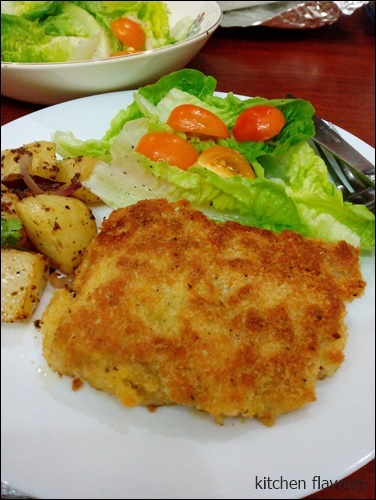 For the Parmesan Chicken, Ina uses chicken breast but I have used boneless thigh instead, as that was what I had in my freezer. Pretty easy to make, the chicken is coated with seasoned flour (a mixture of flour, salt and pepper), then dipped in beaten egg, and drenched with a mixture of dry breadcrumbs and grated parmesan cheese. Heat two tablespoons of oil (Ina uses a mixture of butter and oil), fry on both sides until golden brown and cooked through. Serve with salad greens with some simple dressing. Ina's salad dressing is similar to the one I always make at home, the only difference is I've added some honey to taste. We love this simple dressing, and one that was often requested by my son and daughter when we have salad like this served alongside roasted meat or chicken. With the added honey, this dressing is especially good with bitter salad greens. I usually served a bowl of this dressing on the table, and let everyone help themselves to drizzle on their own greens, they prefer it that way too! And on the plus side, any leftover greens can be stored in the fridge clean and dry. This is really a simple soup, with two ingredients, silken tofu and pickled mustard greens. 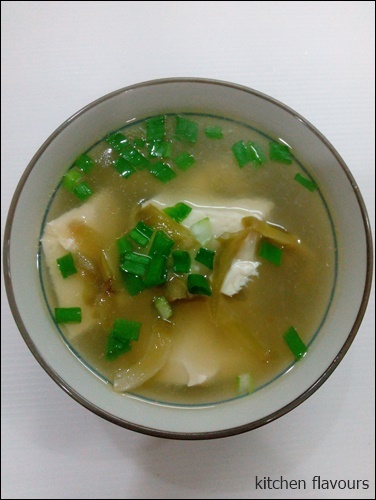 Make sure to use good quality chicken stock, that is what makes this soup. I've used my own homemade chicken stock which I kept a few containers in the freezer, very handy for recipes such as this. For the pickled mustard greens, I have used pickled mustard tubers, sold in packs, sliced and ready to eat. It is one of my favourite pickles to use in cooking and especially good as a condiment to a bowl of plain congee, as it can be eaten as it is. To make this soup, heat some oil, and stir-fry the mustard greens/tubers till fragrant, add the stock and bring to a boil. Add some salt and pepper to taste, the mustard tubers will be salty, so go easy on the salt, you might not need the salt if the stock is already salty. Once the soup is boiling, scoop the tofu in large pieces using a spoon, into the soup. Let the tofu warm gently and absorb the flavours. Dissolve a teaspoon or so of potato flour into cold water, stir to combine and add to the soup to thicken it slightly. Stir gently so as not to break up the tofu pieces, ladle into serving bowl and garnish with chopped spring onion, serve immediately. I have made this soup twice, once with the added potato flour and this time without. I like both versions. If you love a luscious smooth soup then go ahead with the potato flour. For a more soupy soup, omit the potato flour. We really like this soup, yum! It's Autumn Hues! at I Heart Cooking Clubs (IHCC). The colours of autumn ; orange, yellow, red and brown. We are cooking with Ina Garten, and I've made her Marinara Sauce. This is sooooo easy to make, and taste great! I've used canned plum tomatoes in puree, and did the chopping in the saucepan itself, breaking up the tomatoes with the wooden spatula, as the tomatoes are soft and breaks up easily. No need to mess the cutting board! And used dried parsley instead of fresh. Go easy on the salt, I use less than half a teaspoon kosher salt, and Ina uses 1-1/2 teaspoons. The canned tomatoes already contain some salt, adjust to taste accordingly. I love marinara sauce, very handy to keep a jar or two in the freezer. 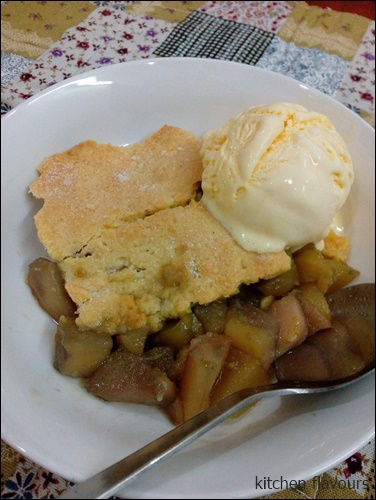 Will definitely make this again. Heat the olive oil in a large (12-inch) skillet. Add the onion and saute over medium heat until translucent, 5 to 10 minutes. Add the garlic and cook for 1 more minute. Add the wine and cook on high heat, scraping up all the brown bits in the pan, until almost all the liquid evaporates, about 3 minutes. Stir in the tomatoes, parsley, salt, and pepper. Cover, and simmer on the lowest heat for 15 minutes. Everyday Stir-Fry Chicken, is just what it is, a simple homey dish that can be cooked in just minutes,. Get the veggies all sliced up and ready, with all the other ingredients close by the wok. Just like most stir-fries, this dish comes together pretty quickly as soon as your wok is hot. You can use either chicken thigh meat or breast meat, whichever you prefer. Any veggies can be used for this stir-fry dish. According to the author, sliced mushrooms, peppers, or even a small handful of soaked cloud ear mushrooms would work very well too. Here, I have used what I had in my fridge ; carrots, celery, spring onion and cucumber. 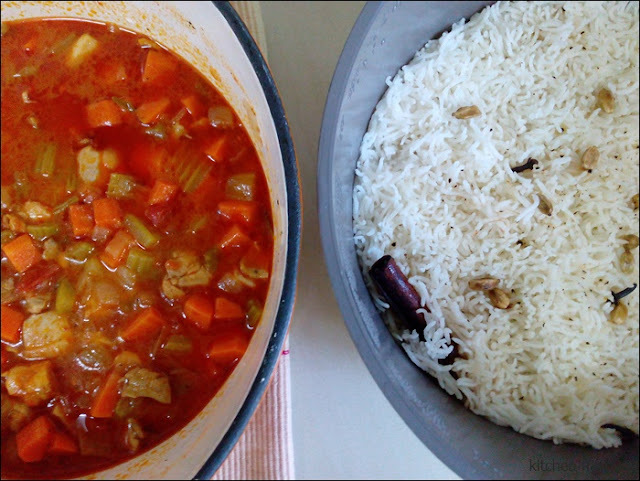 A nice dish to serve with rice along with some stir-fried green veggies, perhaps a plate of omelette and some soup. Lay the chicken thighs out on a chopping board. Whack them up and down with the back of your knife to tenderiz them, then cut into 1/2cm slices along the grain of the meat. Place in a small bowl. Add the marinade ingredients along with 2 tsp water and mix well. Cut the piece of cucumber in half lengthways and discard the seeds. Then cut lengthways into 1/2 cm strips. De-string the celery and cut into strips to match the cucumber. Peel and thinly slice the garlic and ginger. Cut the spring onion white and chilli on the diagonal into thin 'horse-ear' slices. 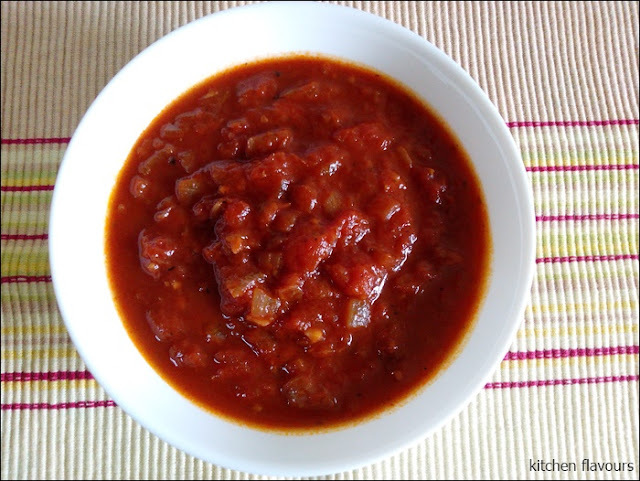 Combine the sauce ingredients in a small bowl. Heat the oil in a seasoned wok over a high flame. Add the chicken and stir-fry briskly. When the pieces have separated, add the garlic, ginger, spring onion and chilli and stir-fry until you can smell their fragrance and the chicken is almost cooked but still a little pink. Add the cucumber and celery and stir-fry until they are piping hot. Give the sauce a stir, pour it into the centre of the wok and stir quickly as it thickens and clothes the pieces of chicken. Serve.